As a fan of horror in its many forms, I want to offer something fresh for the genre. 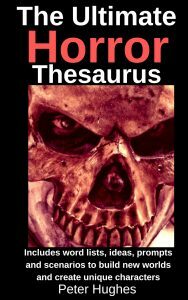 After locking myself away and burning through a dozen ideas, I came up with the idea for The Ultimate Horror Thesaurus. The book contains not only an exhaustive list of words describing carnage and gore but also goes into great detail to cover the worlds in which the monsters live. In short, it is a one-stop resource for horror aficionados to dip into and then reemerge with the words and ideas to describe monsters and their gruesome actions. If it sounds like something you may be interested in, then please check it out and let your friends know. Other than writing my hobbies include language learning and my Youtube channel Peter Flashman offers tips to practice and has videos in Hindi and Urdu. As a lifelong comic book fan, my top recommendation would be ‘Charley’s War’ by Pat Mills. It’s an excellent book about a naive sixteen-year-old who enlists (whilst underage) in the first world war. The story is harrowing at times and Charley has many near misses, not only in the trenches but also back home in Blighty. I would have to say my favourite Marvel character is the Punisher and enjoyed seeing him in Daredevil and his TV show.